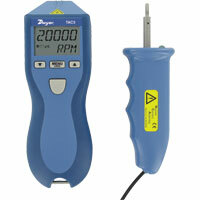 Pocket Tachometer measures and displays rotational speed of saw blades, grinders, engines, motors, and conveyor belts. Programmable to read in English or metric units. Portable Digital Tachometer measures rotational speed by contacting a rotatable head to the shaft of the object or by using photo sensor to detect the reflections from the laser. Comfortable fit in user's hand.